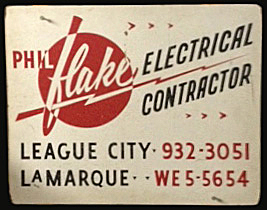 Rick Flake’s father, Philip S. Flake Jr., started and ran his own electrical contracting business in Galveston County from the early 1960’s until his retirement in the late 1980’s. Rick and his four brothers all worked in the family business at one time or the other (his sister was allowed to miss the fun). Several brothers continued in their father’s industry: one became an electrical engineer, one started and owns an electrical contracting business and one runs the electrical department at Lowe’s. However, Rick found it too hot on the gulf coast to work outside so he went to school and got a law degree. When Rick opened his solo ADR practice, he paid tribute to his father’s legacy by recreating the Flake Electric logo for his own business.